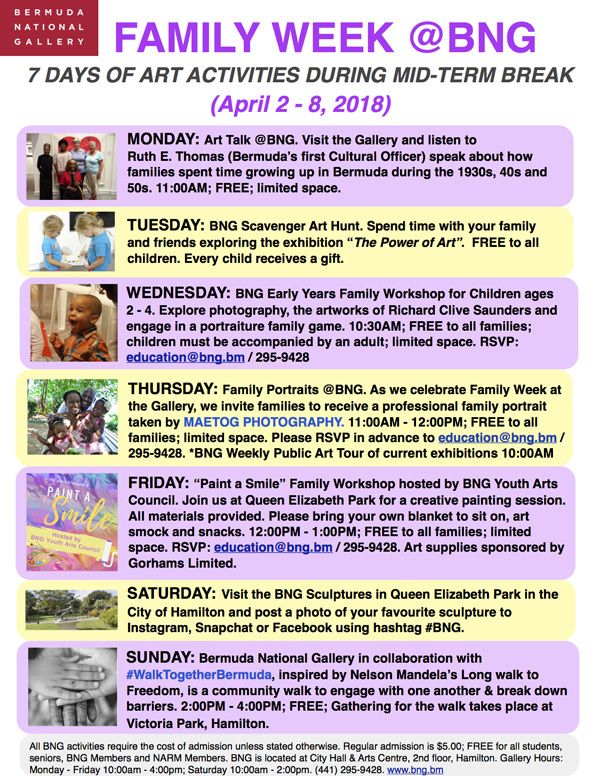 The Bermuda National Gallery [BNG] is hosting a number of art activities for families and children in the community during the school mid-term break. Ruth E. Thomas [Bermuda’s first Cultural Officer] speak about how families spent time growing up in Bermuda during the 1930s, 40s and 50s. 11:00AM; Free; limited space. Tuesday, April 3: BNG Scavenger Art Hunt. Spend time with your family and friends exploring the exhibition “The Power of Art”. Free to all children. Every child receives a gift. Friday, April 6: “Paint a Smile” Family Workshop hosted by BNG Youth Arts Council. Join us at Queen Elizabeth Park for a creative painting session. All materials provided. Please bring your own blanket to sit on, art smock and snacks. 12:00PM – 1:00PM; Free to all families; limited space. RSVP: education@bng.bm / 295-9428. Art supplies sponsored by Gorhams Limited. Saturday, April 7: Visit the BNG Sculptures in Queen Elizabeth Park in the City of Hamilton and post a photo of your favourite sculpture to Instagram, Snapchat or Facebook using hashtag #BNG. Sunday, April 8: Bermuda National Gallery in collaboration with #WalkTogetherBermuda, inspired by Nelson Mandela’s Long walk to Freedom, is a community walk to engage with one another & break down barriers. 2:00PM – 4:00PM; Free; Gathering for the walk takes place at Victoria Park, Hamilton. “Families are also invited to visit the Gallery anytime during the month of April to view the current BNG exhibitions, including “The Power of Art”, “Peter Woolcock: A New Bestiary for Children” and “Shepard Fairey: rebel with a cause”. “To participate, all BNG family activities require the cost of admission unless stated otherwise. Regular admission is $5.00; Free for all children, students, seniors, BNG Members and NARM Members. “BNG is located at City Hall & Arts Centre, second floor, Hamilton. Gallery Hours are Monday to Friday, 10.00am to 4.00pm and Saturday 10.00am to 2.00pm.